Recently it was stated by our HOA president of the neighborhood of Park Landing that another fitness center is projected to be constructed on the corner of Brunswick Forest Parkway/Low Country Blvd across from the neighborhoods of Parkway Crossing and also Tennyson Village. By the time that happens, there may be houses constructed on the other side of the railroad tracks and Parkway crossing may be built out. When that happens it is anticipated that there will then be 2 lanes going south on BF Parkway over the railroads tracks or taking a left onto Low Country or turning right into Parkway Crossing, cars coming out of Parkway Crossing, possibly taking a right or going straight to the median to take a left onto Low Country or straight on Low Country. Meanwhile there will be cars travelling north on BF Parkway from across the tracks, turning right onto Low Country or taking a left to go into Parkway Crossing or going straight on BF Parkway. Then there are the cars coming out of Low Country that can take a right or cross to the median to go left or go straight to Parkway Crossing. Add to that all the cars that will be going into and out of the new fitness center located there, the intersection will be just as dangerous as the one at the other intersection of those two roads and the current fitness center. With just a little forethought in the planning stages, maybe some of that congestion could be avoided by at least placing the exit and entrance to the new fitness center in a way that it doesn't add to the inept traffic pattern or at the very least, in order to maintain a safe traffic pattern, add stop signs or a traffic light to begin with. It will be cheaper to do it at this point rather than after everything is complete. I know I would appreciate it, and many others will also. Maybe the possibility of serious accidents taking place there at the very least would be minimized. Is there any additional safety measures planned to take place before or at the time of construction at that particular intersection? I hope the Town of Leland would monitor the construction and put in the proper safety measures so so all traffic can travel through there safely. The Town of Leland and our engineers are reviewing Brunswick Forest Parkway & Low Country intersection (first one) at this time. Thank you for your comments. To Public Works Manager, I'm not quite sure what BF Parkway and Low Country Blvd you are referring to as the (first one) but I'm referring to the fitness center not yet built on the other end where both of those roads intersect by the railroad tracks. There already has been much discussion concerning the existing fitness center without anything being done by the town. I would like to eliminate having the same problem at the new fitness center that exists at the current fitness center. It is my belief that if it is done right the first time and with some forethought by the developer and the town of Leland, that problem can be avoided. Why are dump trucks coming from the new developments in Mallory Creek (Belville) using the Rice Gate entrance into Brunswick Forrest, and then driving through our neighborhoods on Lillibridge, Low Country, and Brunswick Forrest Pky. to accrees Hwy. 17. They are a hazzard to pedestrian and local vehicular traffic, and are not observing the posted speed limits. As I assume this traffic originates in Belville, why are they not required to use Hwy. 133? If you witness any violation of the law, please report this to the Leland Police Dept. 910 371 1100. Thank you. Mallory Creek is located in the Town of Leland. Low Country Blvd., Rice Gate Way, Mallory Creek Dr., Brunswick Forest Parkway, and Lillibridge Dr. are all Town of Leland Public Streets and can be used by the public. Please notify me if see any damage to our streets. Light is out in Lamp Post located in front of 2076 Forest View Circle, Brunswick Forest (Park Landing). BEMC has been notified of the situation and will respond as soon as possible. Your request has been closed at this time. If you have any questions, please contact us at (910) 371-0148 or visit www.townofleland.com. Thanks for getting involved. Light burned out in streetlight located in front of 2076 Forest View Circle in Brunswick Forest. Brunswick Electric (BEMC) has been notified. They will make repairs as soon as possible. Light keeps flashing off and on. More off than on. Thank you for reporting this issue. We will review the issue right away. If you have any questions, please contact us at (910) 371-0148 or visit www.townofleland.com. BEMC has been notified. Repairs to the street light will be completed very soon. 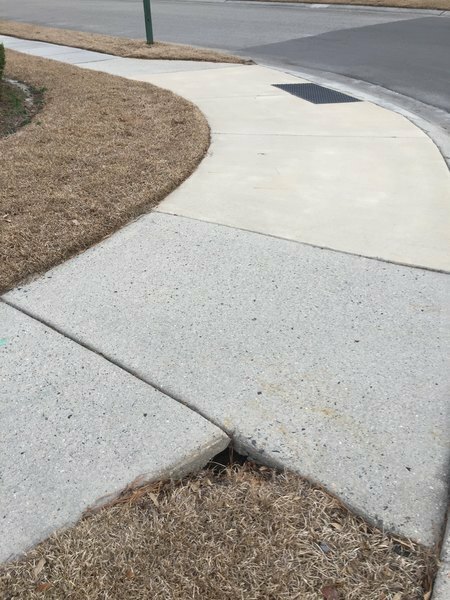 Received report the curbing at the traffic circle in Grayson Park has been damaged, possibly by a large construction vehicle.